On the east side of Zion National Park, detailed patterns have been wind swept into blond slickrock and imbedded with subtle tints of yellow, pink and green. A wonderland of geological processes twisted and tortured the rock and sand into magnificent arrangements of stone. Uplift and erosion resulted in spires, domes, hoodoos, mountains and an occasional arch. A few arches stand today in the arid landscape of the park. Although arches are common in other areas of southern Utah, there is no place that surrounds them with such sweet scenery as does Zion. Two Pines Arch is such a treasure. Climb Progeny Peak above the arch and panoramic majesty unfolds in every direction. Progeny Peak Distance: .8 mile one way. Total hike distance to summit and back: 1.6 miles. Average Hiking Time: 3 hours to the peak and back. Equipment: Carry at least 2 quarts of water per person, energy foods, basic first aid kit, emergency supplies and proper clothing for the season. Always wear sturdy sticky rubber shoes when scrambling on slickrock. Difficulty: The hike to the arch is a quick jaunt, but if going to the peak the hike becomes moderately strenuous with exposed slickrock scrambling. Trailhead: The trailhead is on the north side of the Zion-Mt. Carmel Highway (Highway 9) and just east of the Zion-Mt. Carmel Tunnel . Look for the small wash, identified by a yellow sign that says: "Caution Delays Possible Be Prepared to Stop". 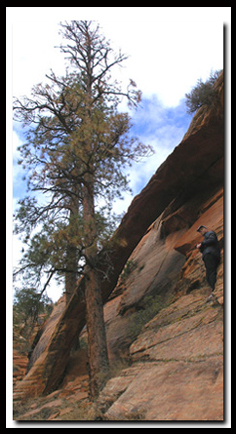 Trail Access: The Zion-Mt. Carmel Highway is open year-round. Best Season: The best time of the year is spring, fall and even, but only hike on slickrock when the surface is dry. If hiking in the summer begin early in the morning to reduce sun exposure. Scrambling on slickrock should only be attempted by experienced hikers. It's important to only wear sticky hiking shoes to help grip the rock and to help avoid accidents. Slickrock is dangerous when wet and cold. The rock is often dotted with moss, which holds water and becomes slippery like ice when it's cold out. Two Pines Arch is visible from the Zion-Mt. Carmel Highway, but it's difficult to see without knowing exactly where to look. The short 45 minute hike to a view point of the arch is fun and easy. The hike to the arch is a fairly easy one with the exception of one short section that requires scrambling. Hiking to the top of Progeny Peak offers exceptional views, but slickrock scrambling is required. The hike begins .4 mile east of the Canyon Overlook parking lot, which is located on the east side of the Zion-Mt. Carmel Tunnel. More parking is available 100 yards east of the tunnel. Yet another small area to park can be found 200 yards east of the caution sign. The trailhead is on the north side of the Zion-Mt. Carmel Highway, east of the tunnel. Look for the small wash, identified by a yellow sign that says, "Caution delays possible be prepared to stop". Cross over to the north side of the road and enter the wash on the east side, hugging the mountain, until a path of use is visible leading down into the wash. Once in the bottom of the wash, hike north for 150 yards, where the drainage splits in two. The prominent drainage veers to the northwest, and a less prominent wash goes to the right in a more northerly direction. Go right (north) and soon the wash will become more apparent. Continue hiking, staying in the watercourse. Soon a small layered dry fall is encountered. Continue up the dry fall and the wash opens up. Look to the right at the base of the cliff where "Two Pines Arch" can be seen. The arch is surrounded by Ponderosa Pine trees. At about .3 mile into the hike, the route leaves the easy terrain of the wash. Steer directly up the slickrock toward the arch. The climb is moderately steep, but it is only .1 mile. Now that you know where the arch is it will be easy to see when you return to your car. From "Two Pines Arch," the climb to the summit of Progeny Peak gets steep and tricky, so finding the easiest path up is important. Hike north from the arch, to the left side of the buttress. There is a steep slab to negotiate almost immediately. Use the ridges in the "slabby" rock to your advantage and travel will be easier. At the top of the slab it becomes evident that heading right on top of the ridge is easier. Soon the top of the saddle is acquired. Hoodoos are to the west, and the summit of Progeny Peak towers above to the northeast. From the saddle, walk easterly in the general direction of the summit and work through the ledge systems. Soon travel is easiest if you traverse slightly right and up the slabs toward the shoulder, formed on the south side of the summit. Heading too far to the north, (left) will only make the climb steeper. Some small ledges need to be negotiated on the way up to the south shoulder of Progeny Peak. Once on the south shoulder, bear to the north and it will be a short uphill scramble to the summit. Once on top , looking southwest from Progeny Peak, the end of the Zion-Mount Carmel Tunnel is visible as well as Zion's West and East Temples. To the west and north are the Twin Brothers, Mountain of the Sun, Deertrap Mountain and the East Rim. Looking east, views of Crazy Quilt Mountain and Checkerboard Mesa partially hide the white cliffs bordering the Grand Staircase. The sights are truly spectacular and worth the .8 mile hike and 1000' elevation gain. GPS coordinates are only references and may or may not be accurate. Do not rely on GPS coordinates as the sole method of navigation. Always have an accurate, detailed map at hand and have the proper map reading and navigation skills before setting out on any hike. A GPS has limited capabilities in many areas.